Bring the milk to boil in a deep pan. Cook the milk in simmer till it reduces and thickens slightly. Now add sugar and stir it continuously to boil. Mix the grated paneer to it and cook for 5-8 minutes. Add cardamom powder and rose essence. Finally add cashews and raisins after roasting in ghee. Garnish with almonds and remove from flame and let it cool. 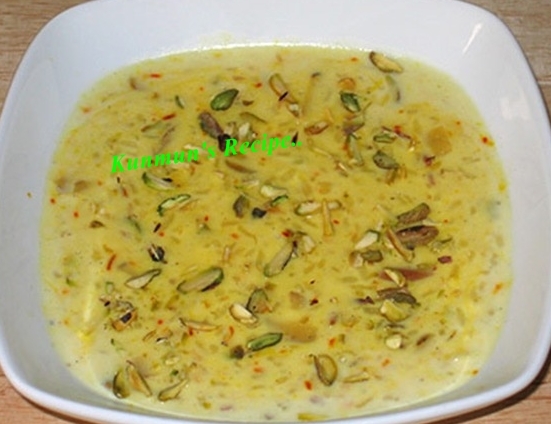 You can be enjoyed Paneer kheer in hot or in chilled condition. Note: Don't over cook the kheer after added panner to the milk. The kheer should not be too watery, it should be normal like any other kheer texture. You can also add 3-4 tsp milk maid (available in market) for better test and colour.